Going into Sunday’s game at Seattle, it is the second straight year that Allen has mostly been kept out of the end zone the first half of the season. He also had only one TD in the Chargers’ first nine games last season. “They will come. I just have to keep doing my job and make sure I am ready when the play comes,” Allen said. Allen hasn’t had a touchdown since the opener against Kansas City. Last season he also had a TD in the opener and then went eight straight games before he scored another. Allen did show some frustration over his lack of touchdowns in the Chargers’ last game against Tennessee on Oct. 21. Allen appeared to be wide open on a third-down play at the Titans 10, but Rivers threw an incomplete pass to Mike Williams, who was covered. Allen kicked one of the end zone pylons after the play and had a brief exchange with Rivers on the sideline. Rivers said this might be the most playmakers he has had during his 15-year career and had no problems with Allen showing his frustration. “I think having that competitiveness and that desire to want it and get it and throw it our way as a quarterback, you want them to all feel that, and we all understand and manage from an emotion standpoint,” Rivers said. Despite having more receiving options, Rivers said he hasn’t seen teams cover Allen differently and that he is still drawing double teams. The double teams have helped Tyrell Williams and Mike Williams make plays downfield. Tyrell Williams has seven receptions for 236 yards and three touchdowns in his past two games. 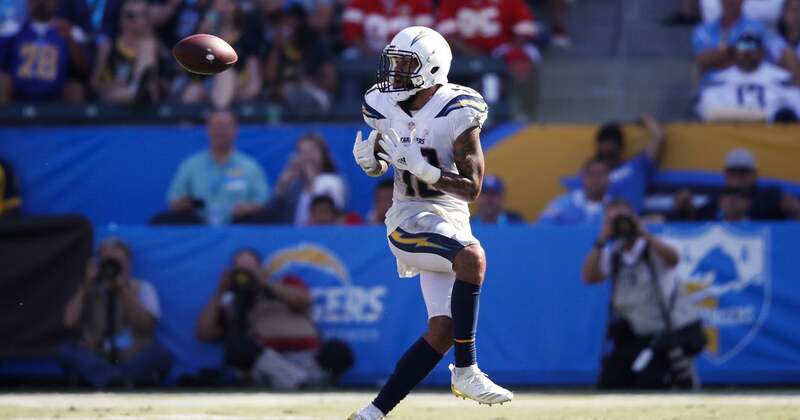 “He’s obviously a huge part of what we’re doing, the third down plays against Tennessee were huge and he’s going to be a big factor and help those other guys have some favorable matchups,” Rivers said. Allen is hoping that his hot stretch comes in November again. Last season he had three straight games where he had 10 or more catches as he had 33 receptions for 436 yards and four touchdowns. Allen will be going up against a Seattle defense that is fourth in the league with 10 interceptions. The Chargers (5-2) have won four straight games and have split the two games at CenturyLink Field since it opened in 2002. The Seahawks (4-3) have won four of their past five, but a benefit for the Chargers is that Seattle’s defensive scheme is similar to their own. That is because Los Angeles defensive coordinator Gus Bradley had the same position in Seattle from 2009 to 2012. “Our players see it every single day, but it’s still a personnel game, matchup game. They put their player in a position to make plays just like we do and we just have to execute,” Chargers coach Anthony Lynn said. Notes: Running back Melvin Gordon, who missed the Tennessee game because of a hamstring injury, was working with his position group during individual drills, but Lynn was not ready to say Gordon was full-go for Sunday. … Lynn said the reason why they kept Caleb Sturgis as kicker was because of Sturgis’ ability the past three seasons to make clutch kicks. Sturgis, who has missed the past two games because of a quadriceps injury, has missed four extra points this season.